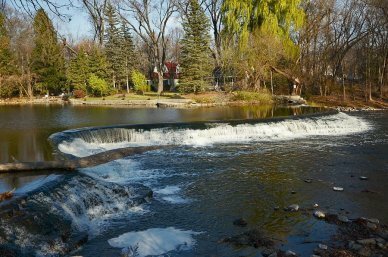 The Fund for Lake Michigan is supporting Milwaukee County Parks with this $200,000 award for the construction of a fish passage structure at the Kletzsch Park Dam. The Kletzsch Dam is a barrier to native fish and other aquatic life passage, and Milwaukee County Parks sees a need for this fishway. The design of the structure will be based on the rock ramp fishway proven to be highly effective at other dam sites. Further, this rock ramp will open 25 miles of Milwaukee River and 29 miles of tributary streams to fish, as well as providing access to 2,400 acres of wetland spawning habitat.